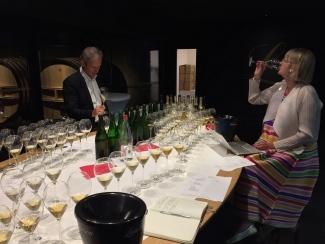 The only thing more impressive than the champagnes on offer at a tasting with Hervé Dantan is the service provided by the man himself. Champagne Lanson’s head winemaker is a one-man hospitality team: expertly fetching, serving, pouring and presenting his wines alone. 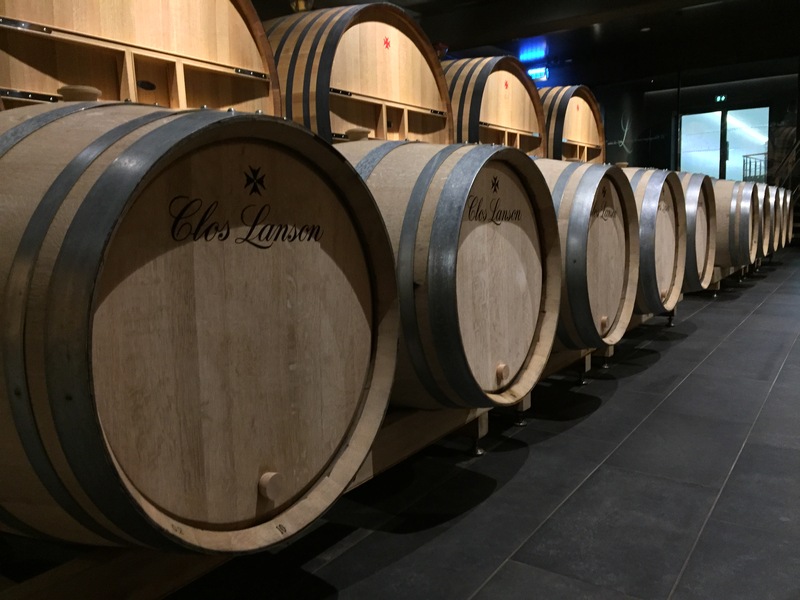 It was a testament to his generosity that he met with us on the morning of August 28th, the day his team had commenced picking in the Aube and the day before they were scheduled to pick the unique single-walled plot Clos Lanson. 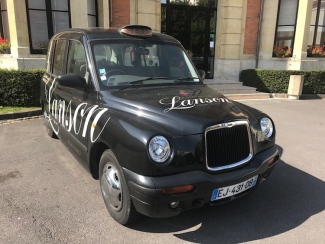 Our visit to Lanson however, was an exploration of the past, not the future. 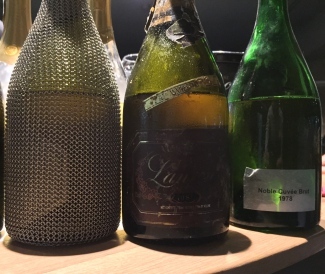 Whilst the primary focus was research for our upcoming Prestige Cuvée vs Vintage tasting with Jancis Robinson MW, Dantan had prepared a time-machine tasting that took us from the vins clairs of the previous year to a non-vintage from the 50s! First up was a vertical tasting of the all-Chardonnay prestige cuvée Noble Cuvée Blanc de Blancs. The concept is to blend only Grand Crus – Avize, Chouilly, Cramant, Le Mesnil-sur-Oger and Oger – and to produce a wine that will age for a very long time. 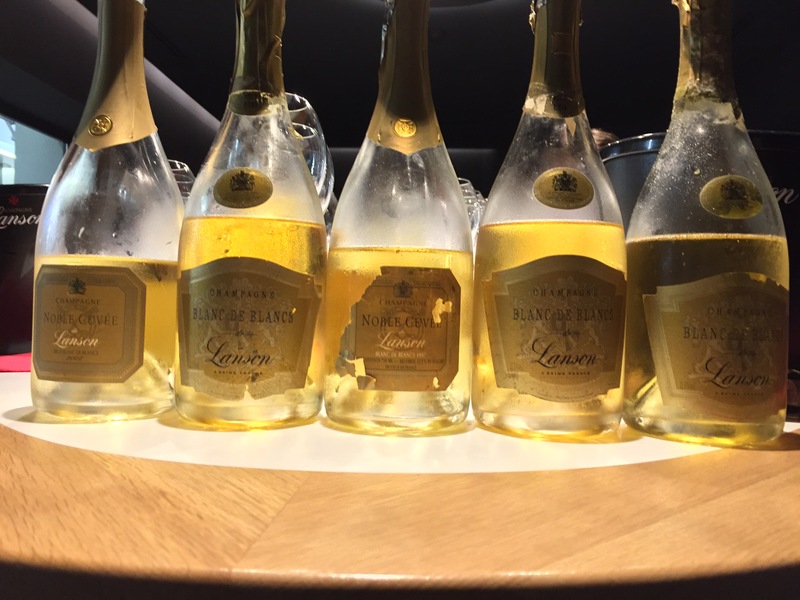 The current vintage is 2002 and the first was 1989, both of which Dantan kindly shared with us. Lots of bright apple and lemons on the nose. Great freshness, light dosage and citrus sherbet flavours. Some tropical notes like pineapple. A lot of acidity. A quiet nose, with hints of coffee and dried fruit on the palate. Lots of creaminess, roundness and loads of acidity. Seems rich and full. Slight banana and apple flavours on the finish. Lovely richness of fruit. Layers of citrus and lemon, perfumed with chalkiness. Vanilla and cream notes come through – at 27 years old this seems ready now. Gone all creamy and vanilla. Loads of acidity and freshness with pear and apple notes. 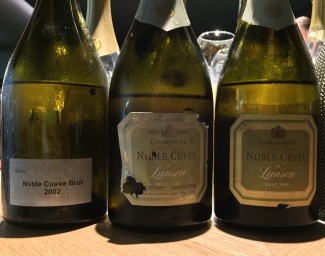 The concept for Noble Cuvée Brut is only subtly different from the Blanc de Blancs. A 70:30 Chardonnay:Pinot Noir mix, the Chardonnay profile is simply the Noble Cuvée Blanc de Blancs blend, to which Dantan adds Pinot Noir from Grand Cru-rated Aÿ, Bouzy and Verzenay. Again, we tasted the first ever vintage, in this case 1978. Quite different nose to 2002 BdB. Less aromatic but more richness on the palate. Like a fruit salad with a lovely mouth-feel. This is very good – go back and some red fruits open up on the nose. Rich and creamy, with an underlying mushroom texture. Great balance; dosage is 7g but doesn’t seem that light. Bright acidity – still seems very youthful. Lovely mushroom and tertiary notes. Quite meaty on the palate and really bright acidity still punches through. Seems to have a hint of sweetness on the end. Rich and voluptuous nose. Great mouth-feel and perfect acidity. Lots of extract. Packed full of lime, lemon and mushroom. Great length. We started our non-vintage journey with a look at vins clairs blends with the previous three harvests as a base vintage: 2016, 2015, 2014. 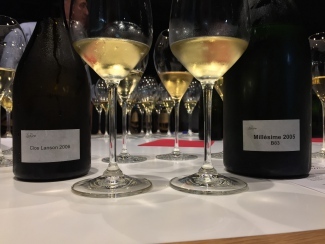 We tasted the finished blend of Black Label NV with 2016 as a base year back in March and were struck then by its roundness and complexity – no doubt a consequence of Dantan’s introduction of malolactic fermentation – qualities that have developed nicely over the last six months. The 2015 blend was a powerhouse as could be expected, while the 2014 was packed with acidity but a little subdued. Moving onto the bubbly blends, Dantan explained that Black Label is a multi-vintage champagne containing wine from over 100 different villages and reserve wine from up to ten different vintages. Asked how much experience it takes to make decent champagne-blending decisions, Dantan responded humbly: “10 years is a good start.” The blend currently sold on the market is Black Label NV based on 2013. Big breadth of fruit and loads of apple aromas. Some richness on the palate with red fruits coming through. Nice balance. Old mushroom nose and bright acidity. Loads of apple flavour and a zingy finish. Very apple fresh. Slight hints of tropical fruit like guava, pineapple and banana. Bright acidity; seems ready for drinking now. Seems very young still. More brown apple character here. Some mushroom and great freshness and acidity. A little short. Zingy but ready. Really pulls you in. Lots of allure – lime flavour and bright freshness. Seems very well balanced today. Yeasty finish with raisons and French patisserie notes. Has gone a bit tired and menthol but still has okay mouth-feel. Just a hint of pine resin and loads of tropical fruit. Quite sweet on the finish. Amazingly vanilla nose and great complexity. Freshness and power are still there. A real fruitiness with lovely acidity and impressive length. Nice creamy character on the nose. So young on the palate with lots of plum and pineapple richness. Great power of fruit, lovely length and acidity. Bright fruit and lush apple creaminess. Loads of acidity and freshness. Some toastiness from barrel. Very fresh right now, nice saline finish.